The Best Cerebral Palsy blogs from thousands of top Cerebral Palsy blogs in our index using search and social metrics. Data will be refreshed once a week.Also check out Top Cerebral Palsy Youtube Channels list for Top videos on Cerebral Palsy. Facebook fans 121,178. Twitter followers 3,764. Orlando, FL About Blog Cerebral Palsy Guide is a national support organization dedicated to educating individuals and families about cerebral palsy. While raising awareness about this movement disorder, our team is also committed to providing informational support for children with CP and their parents and caregivers. Facebook fans 3,451. Twitter followers 522. About Blog We provide vital guidance and assistance to parents of a child with cerebral palsy. Information on causes, treatment, financial assistance, and more. Facebook fans 892. Twitter followers 62. About Blog Cerebral Palsy News Today is committed to presenting the CP community with the latest science, health, and advocacy news related to Cerebral Palsy. New York About Blog Love That Max is a blog by Ellen Seidman, Max’s mom, who writes about her life raising her son with cerebral palsy, as well as many other things. Facebook fans 10,616. Twitter followers 19,414. Florida About Blog Cerebral Palsy Group is a support and education oriented organization that provides information to parents of cerebral palsy. New York, NY About Blog The Cerebral Palsy Foundation is dedicated to transforming lives for people with cerebral palsy today through research, innovation, and collaboration. Facebook fans 97,514. Twitter followers 2,350. Sydney Australia About Blog World Cerebral Palsy Day is a movement of people with cerebral palsy and their families, and the organisations that support them, in more than 60 countries. Our vision is to ensure that children and adults with cerebral palsy (CP) have the same rights, access and opportunities as anyone else in our society. Facebook fans 20,950. Twitter followers 2,530. United Kingdom About Blog The CP Diary is a blog by someone with Cerebral Palsy, covering Health and Wellbeing, Diet and Nutrition, Alternative Therapies, Exercise and more. Facebook fans 199. Twitter followers 2,258. Pennsylvania, USA About Blog Welcome to my little piece of the internet. Spoonie. Spastic Diplegia Cerebral Palsy. Chronic blog. INFJ. Aries. Open inbox. Facebook fans 1,156,267. Twitter followers 516,058. Facebook fans 66,929. Twitter followers 26,707. Facebook fans 1,758,067. Twitter followers 216,138. Facebook fans 267,289. Twitter followers 11,804. About Blog The national developmental disability news site covering autism, cerebral palsy, Down syndrome, intellectual disability and more. Facebook fans 63,312. Twitter followers 38,589. Australia About Blog Cerebral Palsy Alliance provides essential services and equipment for families who are living with disabilities. This can mean providing anything from an electric wheelchair to regular physiotherapy. Facebook fans 59,283. Twitter followers 4,873. Cleveland About Blog Online home for Zachary Fenell, author, public speaker, and all around cerebral palsy advocate! Facebook fans 124. Twitter followers 2,676. Washington, DC About Blog United Cerebral Palsy (UCP) educates, advocates and provides support services to ensure a life without limits for people with a broad range of disabilities and their families. Facebook fans 43,102. Twitter followers 8,257. South Carolina, USA About Blog Cerebral Palsy Daily Living is designed to give families and caregivers dealing with CP a central place for practical information and resources within the context of an emotionally-supportive community. Facebook fans 4,575. Twitter followers 4,184. Facebook fans 247. Twitter followers 546. About Blog The Cerebral Palsy Career Builders Blog highlights Jim Hasse's latest tips for parents who are career coaching CP youngsters between 7 to 27 years old. About Blog By supporting innovative rehabilitation and research, the CCPM team is committed to standing in the gap to encourage, educate and empower all those impacted by a Cerebral Palsy diagnosis. About Blog For the majority of my childhood, I rarely spoke about my disability, but a writing class that I took in my senior year of high school changed everything, and I realized that I had words to share with the world. I am 22 years old and I have mild spastic diplegia cerebral palsy. My disability has shaped me as a person in so many ways, but I am much more than my diagnosis. About Blog My name is Hannah Thompson. I recently graduated from Elmhurst College with a B.A. in Communication. I am a motivational speaker encouraging people to do their impossible. I was born with Cerebral Palsy and that does not stop me from doing anything! I am changing the world one audience at a time! Facebook fans 3,485. Twitter followers n/a. About Blog Welcome to Cerebral Palsy Strong! My name is Katy Fetters & I started CPstrong in order to sustain my existence in the online space long after my blog for teens with cerebral palsy fell behind as I entered into adulthood. Most importantly, I want to have a place where I can share stories about myself, others, and our experiences of life [in our 20's] with cerebral palsy. Facebook fans 1,442. Twitter followers 1,836. Facebook fans 1,753. Twitter followers 1,664. CANADA About Blog Growing up living with cerebral palsy, I write this blog from the perspective of a young adult living a life of difference. Facebook fans 266. Twitter followers 1,308. Cleveland, Ohio About Blog The mission of UCP of Greater Cleveland is to empower children and adults with disabilities to advance their independence, productivity and inclusion in the community. Facebook fans 1,544. Twitter followers 540. About Blog I have Cerebral Palsy but it doesn't have me! Facebook fans 42. Twitter followers 622. Facebook fans 557. Twitter followers 25. Maryland USA About Blog Our team is uniquely qualified with both Legal and Medical degrees, which is why we are the choice of so many parents seeking justice for their child with Cerebral Palsy and why others with serious and permanent injuries due to medical mistakes seek out our counsel. Facebook fans 269. Twitter followers 29. About Blog A blog about my amazing daughter, Elin who is living with Cerebral Palsy and making Lemonade every day! Reno, NV About Blog The mission of United Cerebral Palsy of Nevada is to advance the independence, productivity and full citizenship of people with disabilities. Facebook fans 290. Twitter followers 22. About Blog It was Thanksgiving day back in 2002. I was only 23 years old and my life forever changed on that day. I had a placental abruption and Brendan was born at 33 weeks. He lost oxygen during delivery due to incompetent care but was a fighter and turned 13 this year. My journey in life over the past 13 years took many turns I was not expecting but I try to stay strong and have my husband by my side even when I am not. 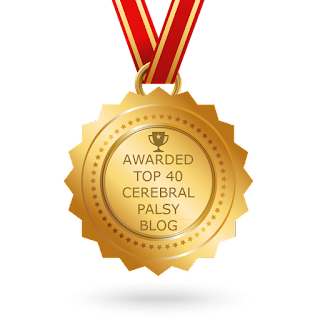 CONGRATULATIONS to every blogger that has made this Top Cerebral Palsy Blogs list! This is the most comprehensive list of best Cerebral Palsy blogs on the internet and I’m honoured to have you as part of this! I personally give you a high-five and want to thank you for your contribution to this world.